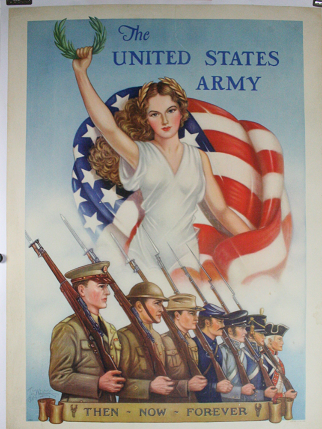 Who is the woman in this United States military propaganda image representing? In this image who or what is the lady in the background representing? That would be Columbia, a female personification of the United States. She's largely been replaced by imagery based on the Statue of Liberty. She's portrayed wearing a laurel wreath, an important Roman symbol of military victory, and holding out another one, which is clearly intended for the soldiers the poster is trying to recruit. There's a bit of Victoria, the Roman goddess of military victory in there, and some of Nike, her Greek equivalent, too. That was Columbia, as in Columbia the Gem of the Ocean. Written in 1843, the song was America's unofficial national anthem, which was a reference to the unofficial name of "America," in the late 19th and early 20th centuries. It was particularly popular in World War I. Both the song and the nickname lost their relative popularity after the adoption of the "Star Spangled Banner" as the national anthem in 1931. The current anthem was a reference to the War of 1812 (against Britain), whereas "Columbia" was an "American" reference shared with Britain (whose Canadian Commonwealth country has a province called British Columbia, which is the northern part of what the Americans used to call the "Oregon" territory). This woman represents victory (this is a WWII recruitment poster). You can see this by the laurels she waves, and wears on her head. If you wish to know who is the model for this woman, please indicate where you found this poster. Who was the first member of the United States Senate to resign? Who thought there might be a war between the British Empire and the United States of America in the 1920s? Who actually paid for the American State Visit Brooch? What was the fastest military draft in the United States?